Ace of Cups' overdue return from obscurity continued yesterday with the release of "Feel Good," the all-woman rock group's first single since forming more than 50 years ago in San Francisco. The Billboard-premiered single, a choppy rock song with 1960s-style organ and tambourine flourishes, appears on Ace of Cups' first-ever album, an eponymous release due November 9 on High Moon Records. 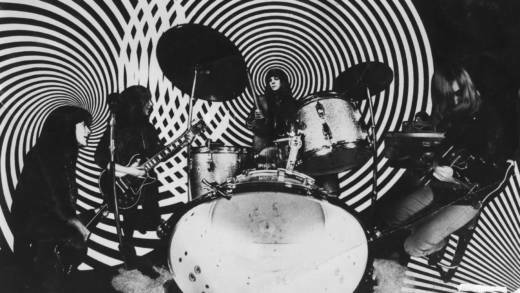 As described in a KQED video last year (below), Ace of Cups were fixtures of the psychedelic rock scene centered in the Haight-Ashbury, performing alongside stars such as Jefferson Airplane and Jimi Hendrix. Despite garnering regional notoriety, they never signed to a record label and disbanded in 1972. "When we split up it was a lot related to the fact that we were having children," guitarist Denise Kaufman says in the video, noting the way gender roles shaped the music scene. "Our brother bands, they were having children too, but they had wives and girlfriends." Gradually, though, Ace of Cups were rediscovered, prompting the release of the 2003 compilation It's Bad For You But Buy It! According to Billboard, High Moon Records operator George Wallace initially contacted the band in search of more unreleased archival material. Instead, the group reformed to record Ace of Cups. "When we got the chance to record through High Moon Records, it started out being 12 songs and now it's 36," Kaufman says in the video. "So it's three records we never got to make."